Take a spring hike in the Blue Ridge in search of the elusive ‘Pink Ridge’. Lovely fragrance and lavender-pink flowers in April and May will win this native selection a spot in the woodland garden. 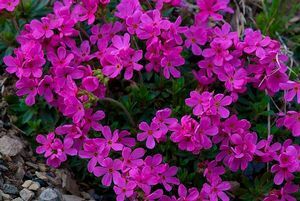 The 6” tall flowering stems hover over the not too aggressive creeping foliage. Provide rich, organic soil and a good bit of shade.